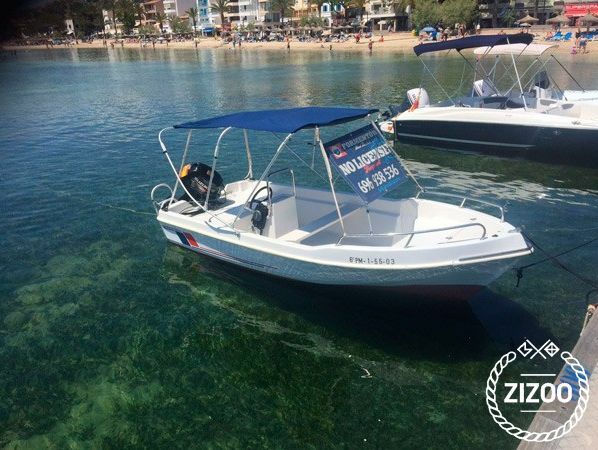 This 13-foot motor boat is perfect for exploring the wonders of Formentor and Pollensa Bay in Majorca Islanf (Spain). It is a convenient and comfortable yacht charter in the Balearic Islands and it is extremely easy to handle and performs well. This motor yacht is spacious and has a canopy for shade while you cruise around looking for the next awesome beach or dive spot. It is a great way to spend an entire day out at sea with your friends, family, and loved ones. It can accommodate up to 4 passengers and is the best charter for your next visit to the Balearic islands. No licence is required to sail this boat.